This game was published multiple times in two separate forms between 1997 and 1999. It has sold out completely. 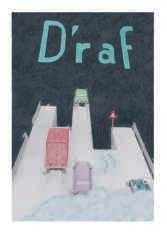 D'raf is a three to five player game simulating a crazy, uncontrolled race on a crowded highway. Instead of a game board, the table is used. The players take turns in laying cards. These cards make up the road on which the players drive their cars. 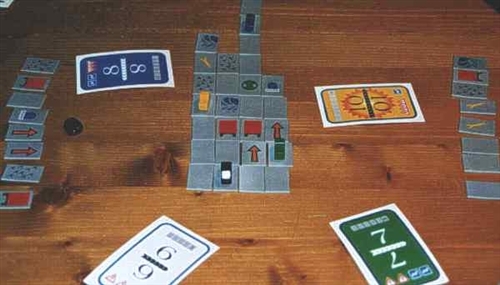 Each player drives his car to the edge of the table as fast as possible. Whoever arrives first and drives off the edge, wins the game. D'raf is well playable in convivial groups, who want to go at each other in a friendly manner. Since the playing time depends on the distance from the starting place to the edge of the table, it can be varied from about 30 to 90 minutes. 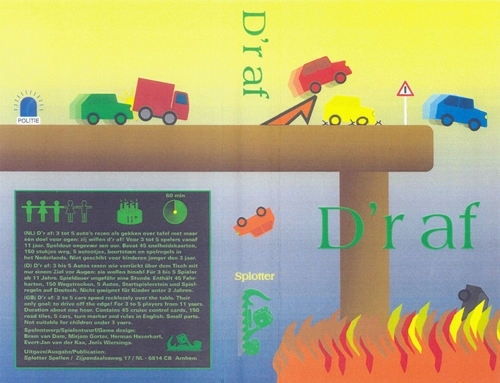 The game contains about 168 laying cards, 45 cruise control cards, 5 little wooden cars, a turn marker and rules in German or English.